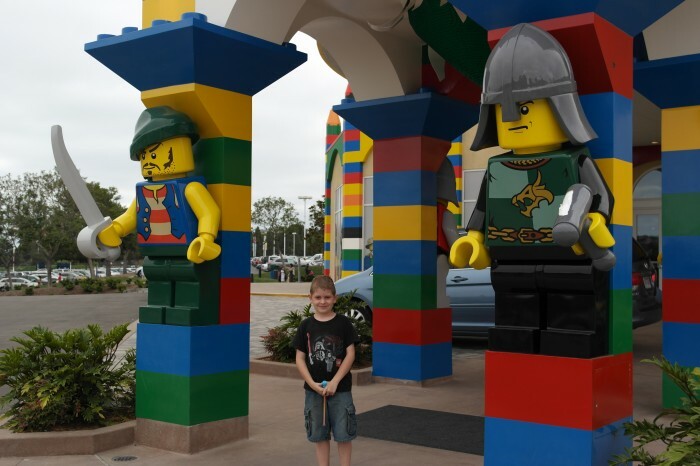 I received 2 tickets to LEGOLAND in exchange for a blog review, I did purchase 2 more tickets on my own. All opinions and photos expressed within this post are my own! We returned about 2 weeks ago from our Clever Vacay in beautiful San Diego, CA. 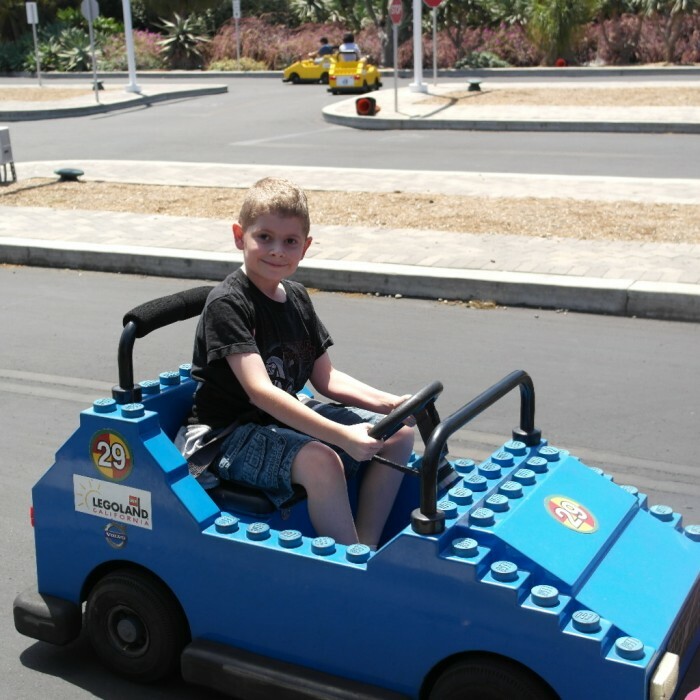 One of the places we went to was LEGOLAND in Carlsbad. 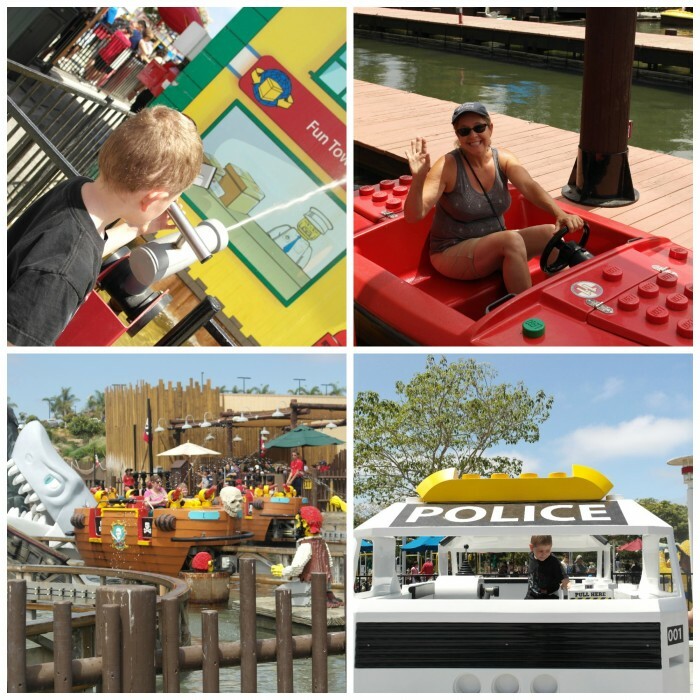 We went last Summer but we couldn’t wait to go back to see a few new things we hadn’t tried and to check out the cool LEGOLAND hotel! 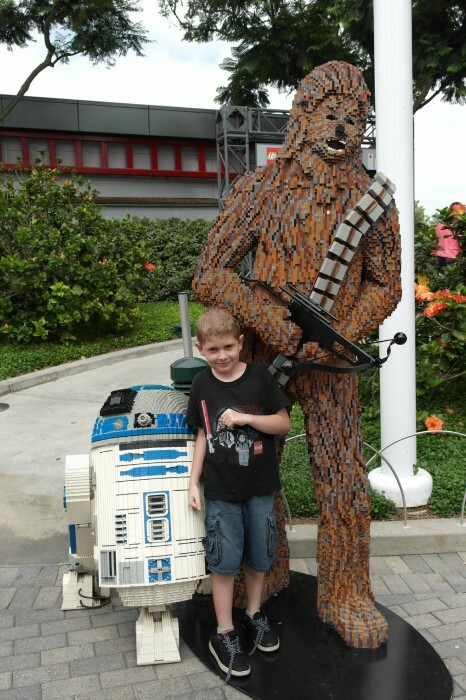 This was a real treat for Clever Guy as he is the perfect age to visit. 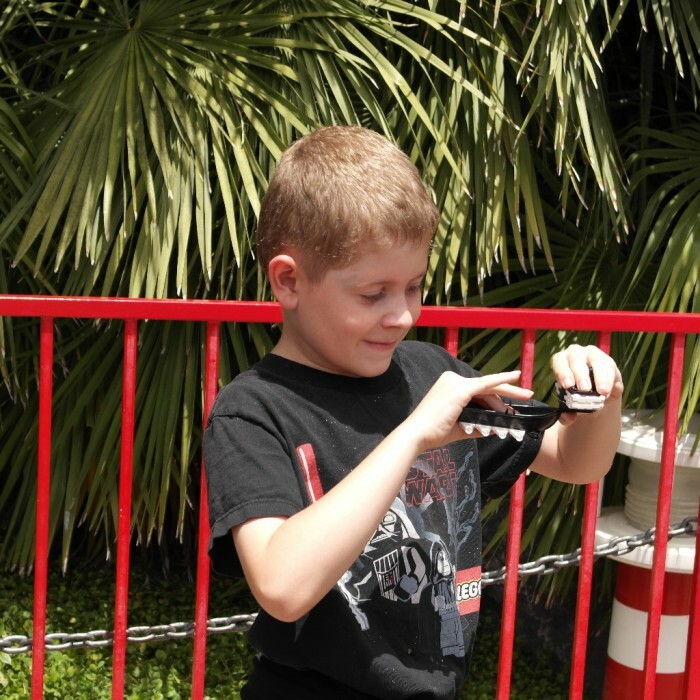 Especially since he isn’t a big roller coaster rider, this park had many rides perfect for his age! 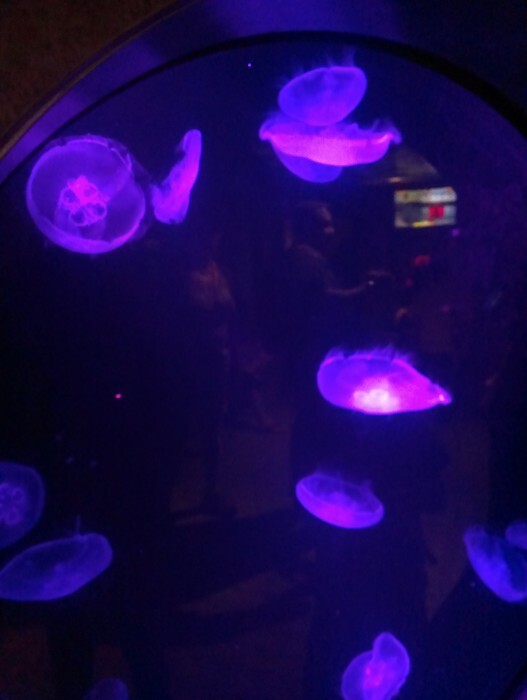 We did the rides, had fun watching shows and meeting characters, enjoyed the LEGO figurines and even got to visit SEALIFE. 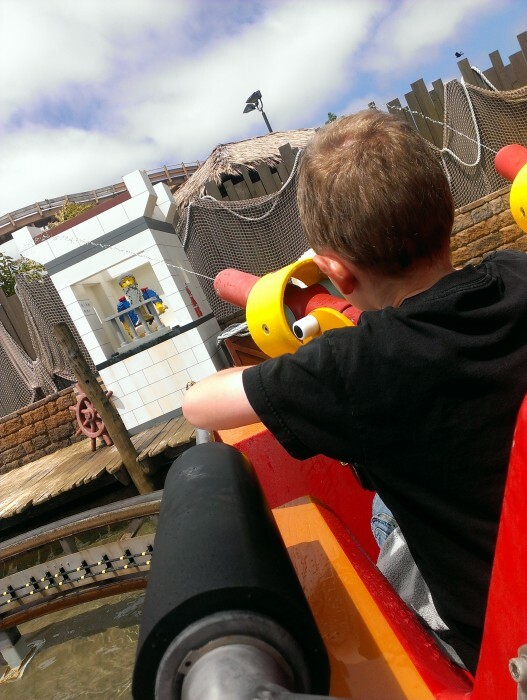 The rides at Legoland are perfect for all ages. They have rides for the little ones and ones for the whole family! 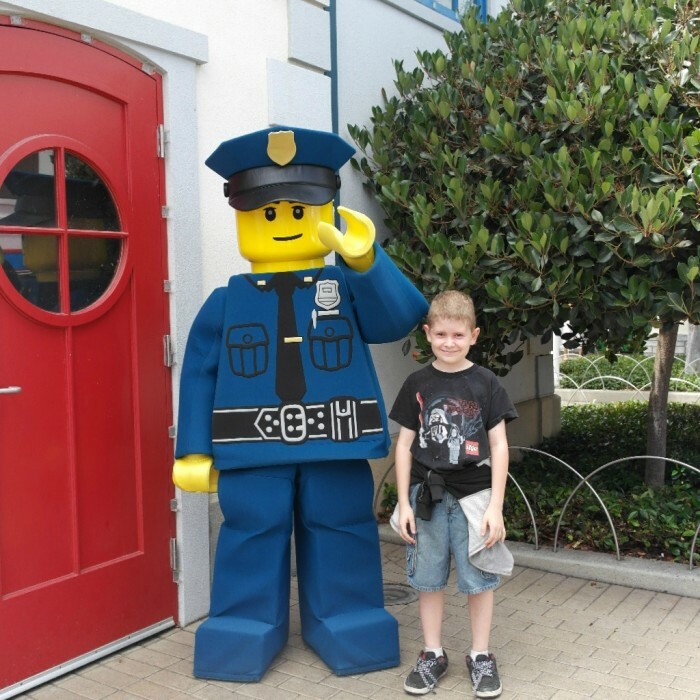 Everyone can enjoy like the Splash Battle in Pirate Shores and the Police and Fire Academy in Fun Town. There are even ones for the older kids! By the way, when you are in Pirate Shores and it says you will get wet, you will get wet! We ended up getting drenched. Good thing I had $5 on me for the huge dryers! One of the things I loved as a parent, some rides had kid play areas by the lines. This meant that parents could stand in line and kids could go build while the parents waited! Sure parents get the boring job but it seems to go by faster when kids don’t say “I’m bored” about 20 something times. What a fun treat, getting to meet real life LEGO men! 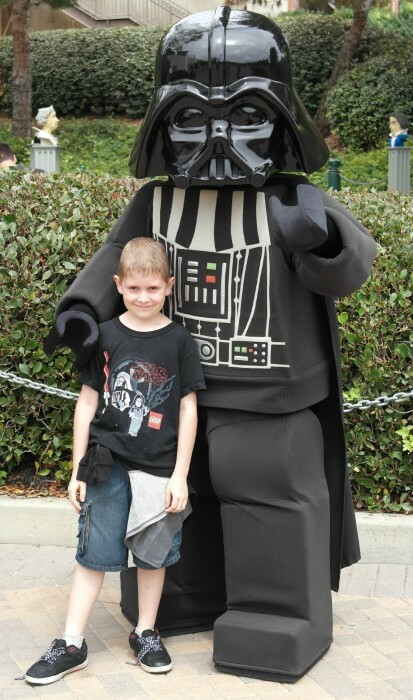 By far our favorite part of the day, meeting Darth Vader! They really do look like oversized LEGO men! 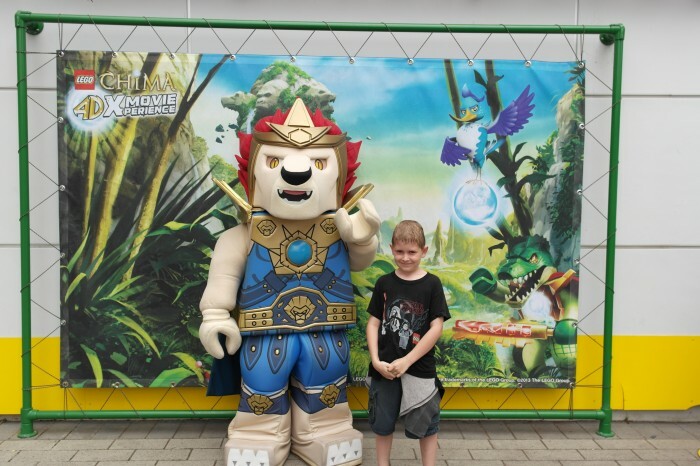 Check out the 4D Movie Experience with different LEGO movies like CHIMA 4D! Need a Break? 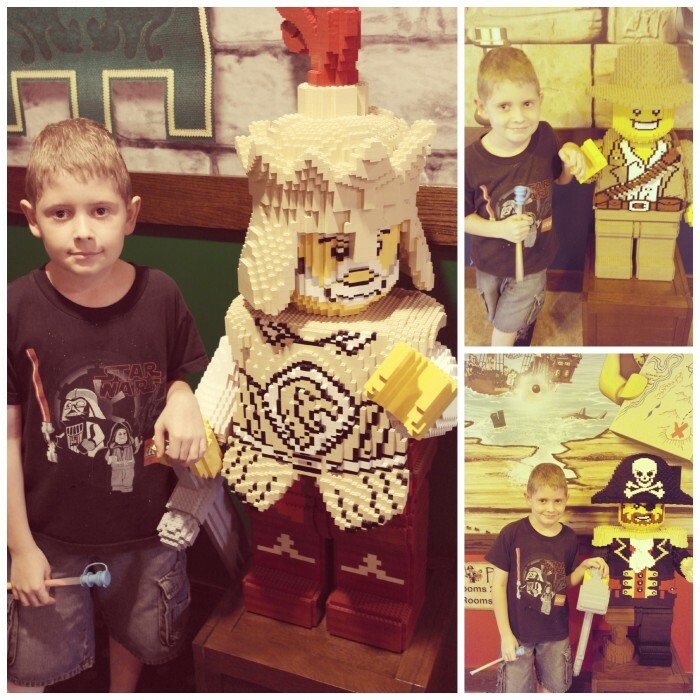 Check out these fun places at LEGOLAND! Miniland is full of miniature versions of cities, made up of over 20 million bricks! 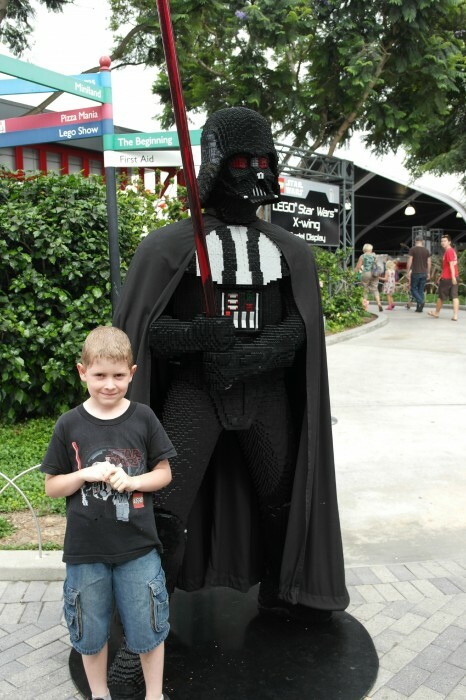 Be sure to check out the Star Wars area for “mini” figures along with scene settings from the movie, made up of nothing but LEGOS! 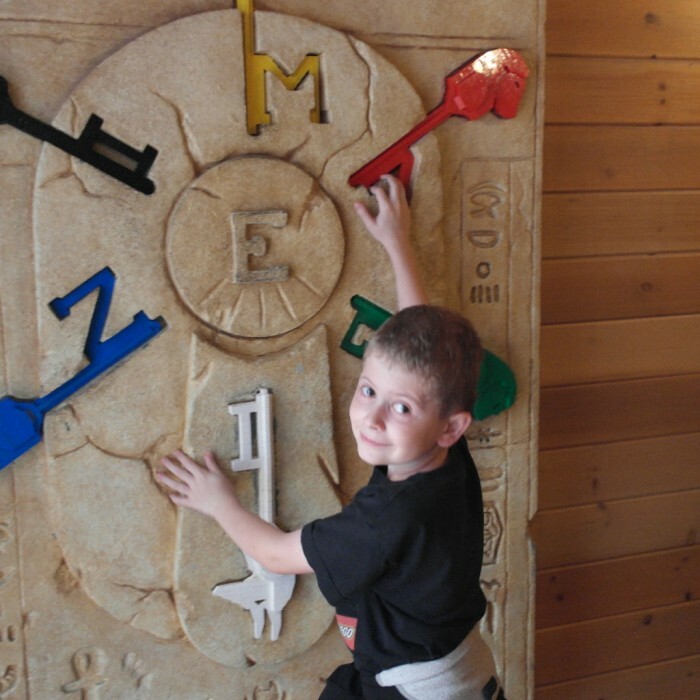 If the kids are getting cranky or maybe it’s getting a little warm, check out the factory tour (it’s free and almost hidden)! 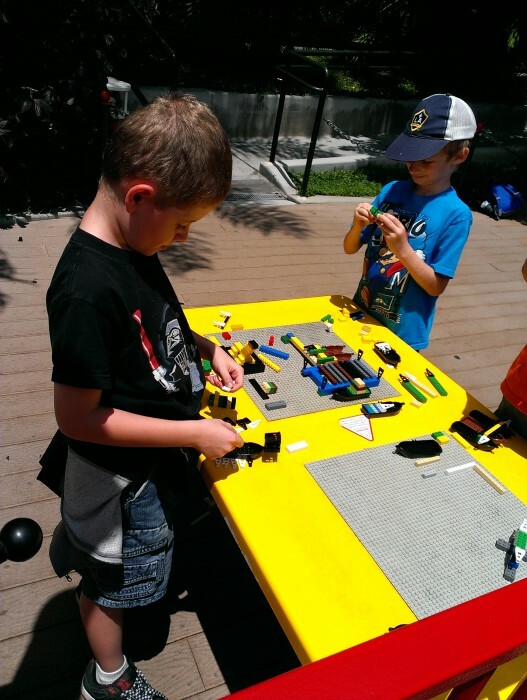 You’ll learn things about LEGO you didn’t know before and you’ll get to see how the factory works, in mini LEGO version of course! We also took a little bit to check out Adventure Club. 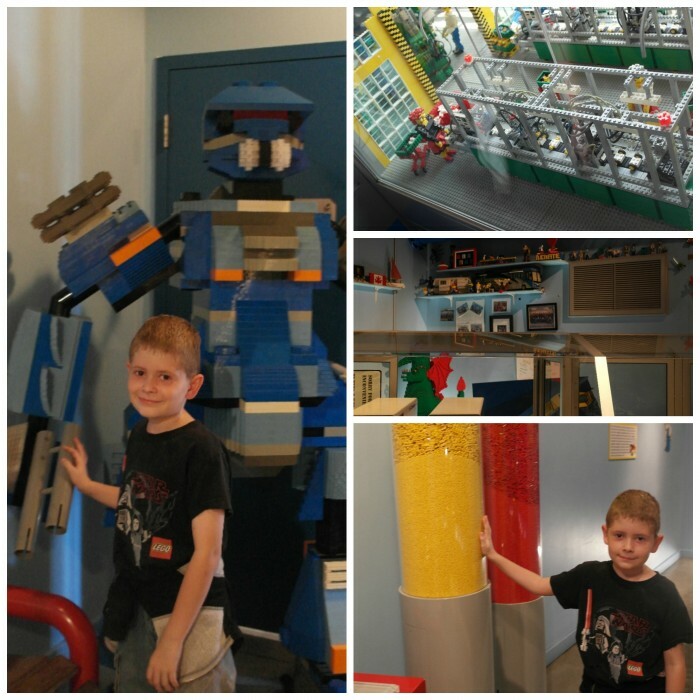 It’s like a scavenger hunt full of adventure and of course, LEGOS! 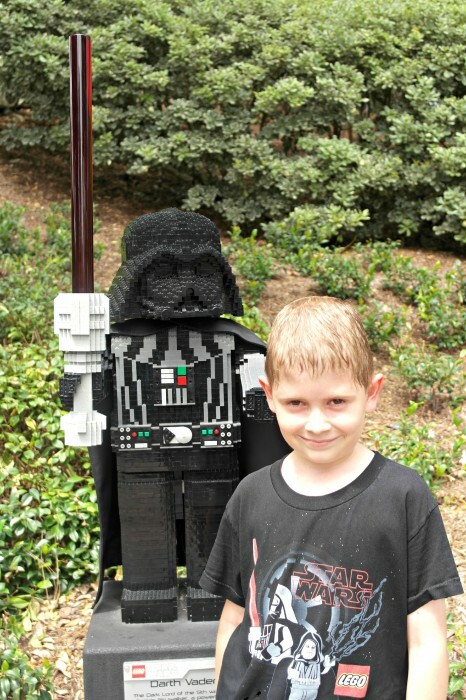 Be sure to check out all of the Star Wars figures at LEGOLAND! 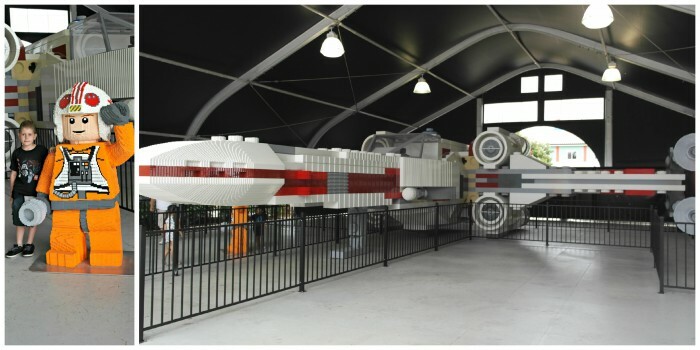 World’s largest LEGO® model ~ Star Wars X-wing starfighter! 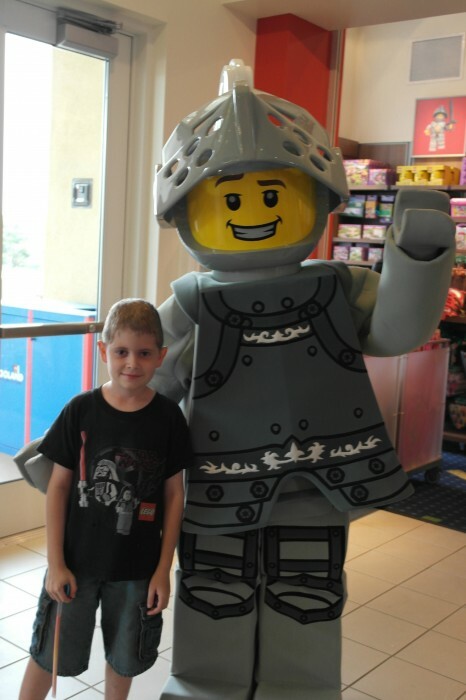 After traveling more than 2,800 miles from New York City’s Times Square, the world’s largest LEGO® model is now on display at LEGOLAND® California Resort. The life-size LEGO® Star Wars™ X-wing starfighter has been assembled by the theme park’s Master Model Builders inside a hangar to be on display for you to enjoy through the remainder of the year. Weighing more than 45,000 pounds and created from five million LEGO bricks, the massive model arrived in six freight trucks which hauled the 1:1 replica X-wing model across the country. The X-wing is 11 feet tall, stretches 43 feet long and has a wingspan of 44 feet. This hotel is right outside the gates of the park and just opened in April! 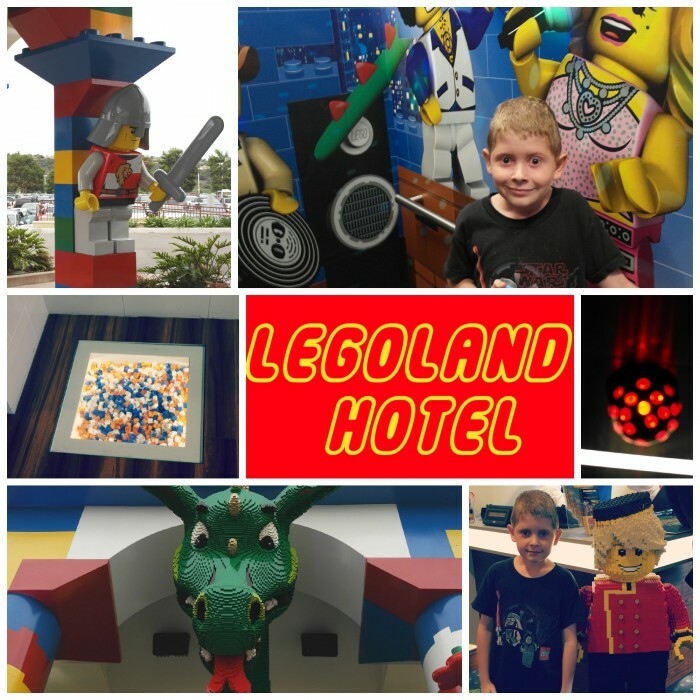 While we didn’t stay at the Legoland Hotel, Clever Guy and I took a few minutes to take a peek inside. This place is awesome! They have LEGOS, everywhere! They have figurines built out of LEGOS, a dragon in the lobby, LEGOS in the floor and each hotel floor has it’s own theme! Need a few minutes of quiet? 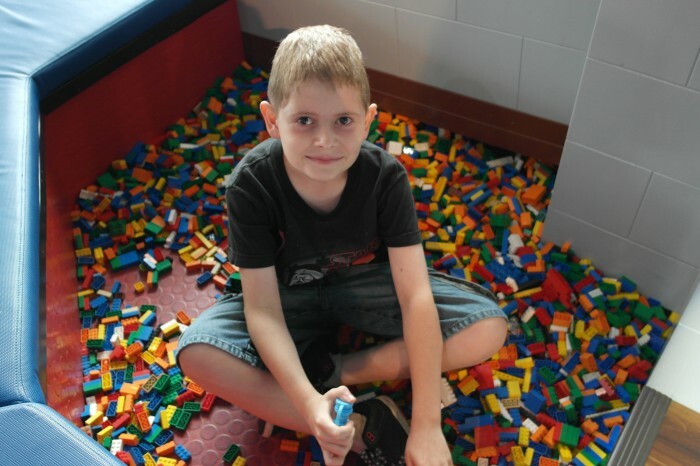 Bring the kids down to the lobby, they can play with the many LEGOS everywhere! There are even LEGOS in the floor! One of our favorite parts? The disco elevator! When you get in, the disco ball starts going and the boogie music starts to play! 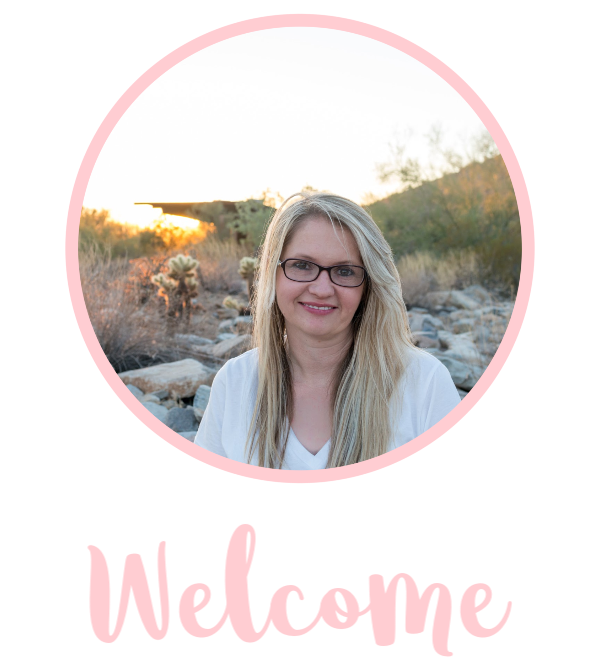 If you are visiting, you’ll definitely want to stay here for convenience & fun! You’ll want to make sure you book early, Summer rooms were selling out quick! 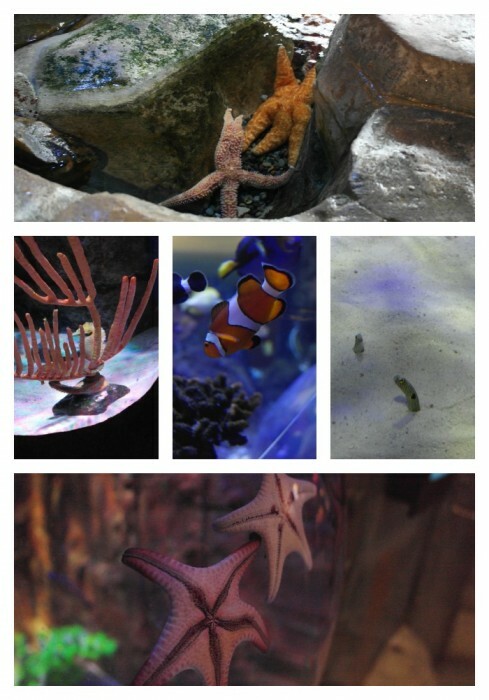 The SEALIFE aquarium is right within the park so be sure to purchase a park hopper pass! It’s a great end to the day! 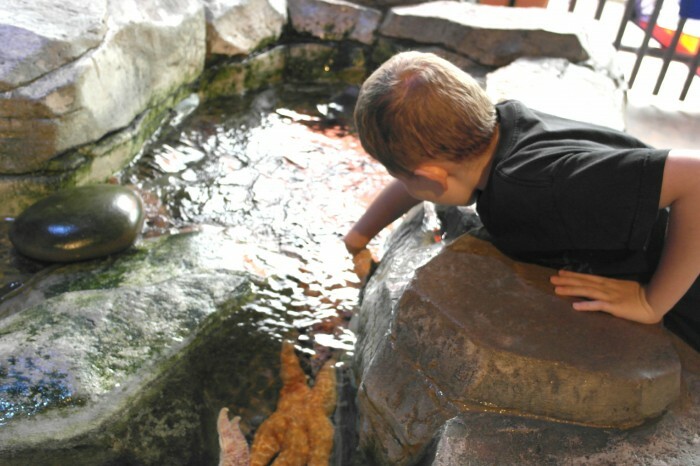 The fishy animals were really cool and Clever Guy really enjoys the touch pools! 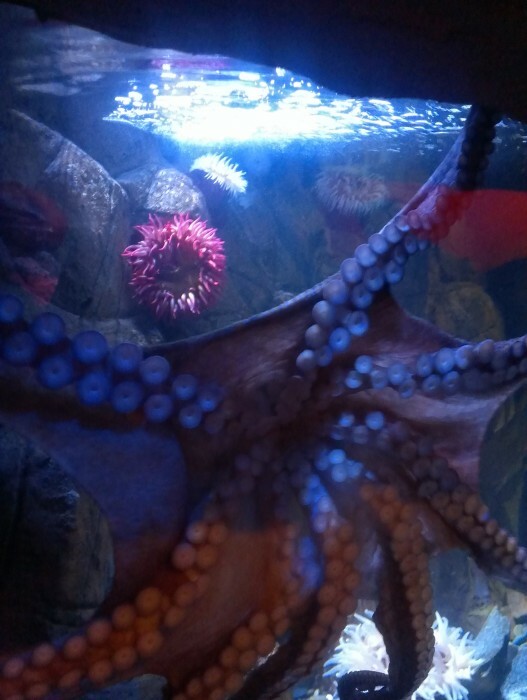 We saw Jellyfish, Starfish, Sea Horses, Sting Rays, Sharks and my favorite, the octopus! Oh and don’t forget about the King Crabs! 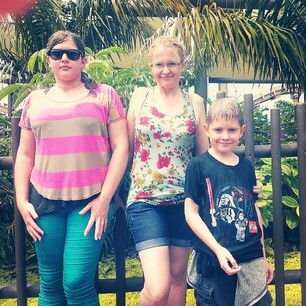 We had so much fun at LEGOLAND, can’t wait to go back! Try not to do just one day, go for more if you can because there is so much to do! 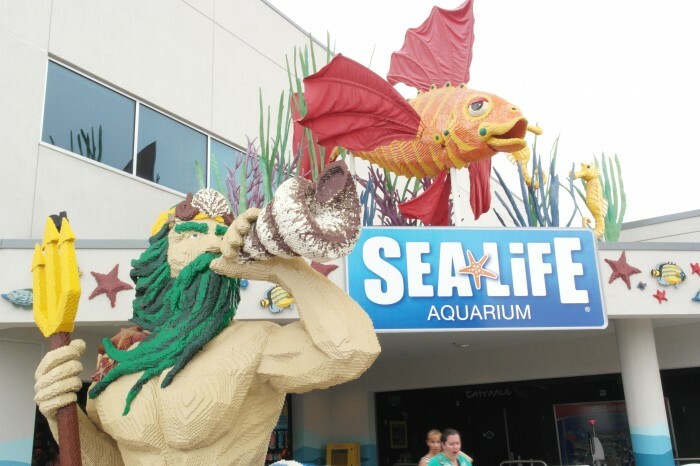 Purchase park hopper tickets so you can also visit SEALIFE and the Water Park (Summer Only). Definitely check for deals, we found that Subway had a deal for Buy One Adult, Get a Kid Free! We only paid half of what we would have normally! Book the hotel when you can, the hotel does book up fast! There is a “food court” area by the Volvo driving school, it’s indoors and reasonably priced, perfect for lunch! Try to visit one of the smaller gift shops, the one near the entrance tends to get busy by end of day! It is definitely something I have to do soon! 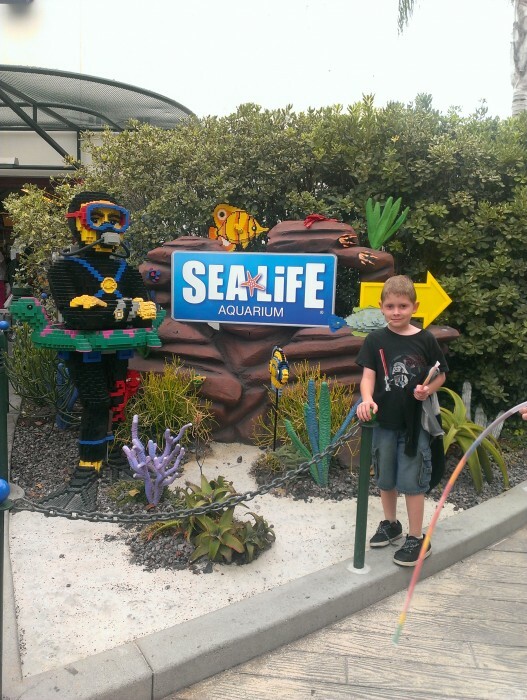 We loved LEGOLAND, the hotel, and SEA LIFE too! Definitely a must do if you have young kids!